Do you ever get bored staring at that black line on the pool floor? Or doing the same stroke all the time? The backstroke is the go-to stroke to add variation to a routine. Often seen as lazy/relaxing– I mean, you can breathe whenever you want. Others say it’s like freestyle on your back. But while it is good for changing up a workout, the backstroke can be rather difficult to master. Since it’s called the BACK-stroke, it seems logical that your back plays an important part. As always in swimming, you need to remain as streamlined as possible- in this case, keep your back straight. If you let your hips drop or your back arch you create more drag. An arching back is a common mistake. The way to correct this is to strengthen your core. If you flex your stomach muscles while on your back you should be able to feel your lower back raise. These stomach muscles are what will keep your back in place, but those muscles will tire quickly unless you build them up. The other common way your back will get out of place is improper head position. 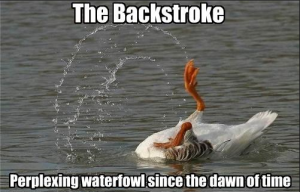 It is common when swimming backstroke to want to tuck your chin down. Not only does it take extra energy to hold your head in that position, but it also causes your hips to drop down and create drag. Instead, you want to relax your neck and lay your head back. When performed correctly, the water level should reach your ears. For many people, the correct head position feels like they’re tipping their head too far back. If it makes you uncomfortable, start with just floating in the water until you are comfortable with your head in the correct position. It’s also important to make sure that you are moving your body correctly through the water. The biggest issue here is not rotating enough. While your back needs to remain flat, it’s very important to rotate your body with your strokes. Imagine a skewer running through your body from the top of your head to the bottom of your toes. Your body should rotate from side to side on this imaginary skewer with every stroke. Not rotating properly could lead to stroke problems and possible injury. While you rotate though, your head should remain still. This can be difficult to do. To help, you can choose something above you to focus on. Keep it in sight. You can also do this drill: Place a cup or your goggles on your forehead while you swim backstroke. The goal is to try and keep the object on your forehead; if your head moves incorrectly, the object will fall off. In addition to normal good kick technique, the backstroke also requires watching how high you kick. You do not want your knees to come out of the water. That creates more drag. But this can be difficult to detect on your own. To correct it, swim while holding a kick board over your legs. If your knees are coming out of the water they will hit the kick board. You could also have someone watch or record you swimming. Also, since most of your propulsion in a kick comes from your ankles, it’s a good idea to practice with fins to increase your ankle flexibility. When do you swim the backstroke? What has helped you to learn the backstroke?